McDonald's is offering a new Strawbery Orange Mango Smoothie but only out in northern California. The smoothie features a strawberry puree made from strawberries that are grown nearby in the Central Coast region of California. It's available through October 2016. 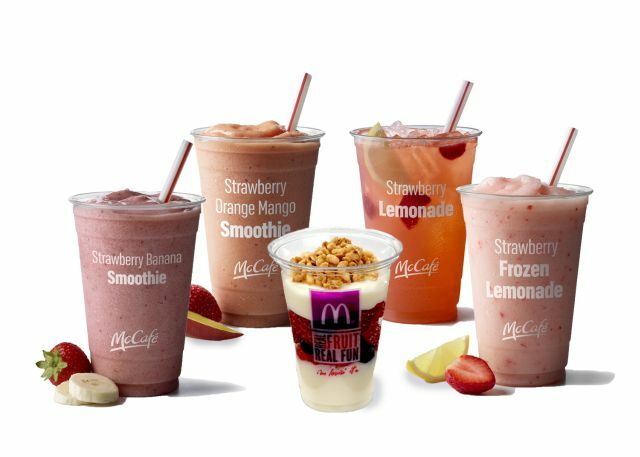 Strawberry is also being featured in the Chicagoland area where the fast food chain is offering McCafe Strawberry Lemonade and Frozen Strawberry Lemonade through August 2016. McDonald's Strawberry Lemonade features strawberry puree and lemonade over ice, garnished with a lemon slice. The frozen version blends the puree and lemonade with ice.